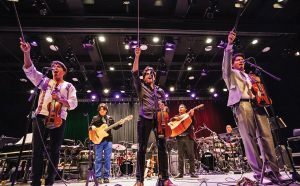 The Villalobos Brothers (Ernesto, Alberto and Luis) use their violines and voices to redefine contemporary Mexican music. Their original compositions masterfully blend elements of jazz, rock, classical and Mexican folk to deliver a powerful message of love, brotherhood and social justice. Artistic Director and guitarist Humberto Flores, drummer Rosa Ávila and bassist Leo Sherman complete the line-up. The Villalobos Brothers have collaborated with legendary musicians including Grammy winners Arturo O’Farrill, Antonio Sanchez, Eduoardo Magallanes, Dan Zanes and many others.